Angela Liddon's irresistible and foolproof recipes have become the gold standard for plant-based cooking. Her phenomenally popular blog and bestselling debut, The Oh She Glows Cookbook, have amassed millions of fans worldwide, eager for her latest recipes. Now, in this highly anticipated follow-up, Liddon shares creative, accessible and delicious ideas that are perfect for busy lifestyles, promising to make plant-based eating convenient every day of the week - not forgetting special occasions. 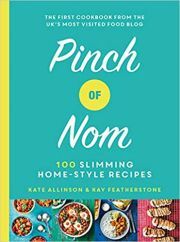 Filled with more than 100 family-friendly recipes, including simple smoothies, breakfasts, snacks and staples, you'll find meals and treats that everyone will love, such as Homemade Sunflower Seed Butter, Sweet Potato Casserole, Lentil-Mushroom Bolognese, Rainbow Quinoa Salad, Ultimate Flourless Brownies and Cookie Dough Balls. Oh She Glows Every Day also offers useful store-cupboard suggestions and tips for kid-, allergy-, and freezer-friendly cooking.